Leadville, Colo. (Aug. 12, 2014) — The Leadville Race Series, produced by Life Time – The Healthy Way of Life Company (NYSE: LTM), will host its iconic Leadville 100 Run event, presented by New Balance, on Saturday and Sunday, August 16-17th. More than 700 competitors will race all day and into the night on the 100-mile course covering grueling Colorado Rockies terrain where elevations range from 9,200 to 12,600 feet and a total climb of 17,000 feet. The entire pool of competitors will start the Leadville 100 Run at 4:30 a.m. on Saturday, August 16th. For more information and complete results visit www.leadvilleraceseries.com. 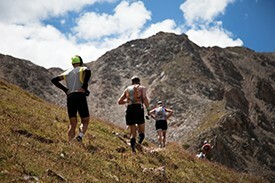 For photos and more visit the Leadville Race Series Facebook page. To learn more about Life Time Athletic Events visit EventsByLifetime.com. About the Leadville Race Series The Leadville Race Series consists of seven running events and four mountain biking events, in addition to six events in the Leadville Qualifying Series. The Race Series stretches across three months, and hosts thousands of racers on foot and on mountain bike in some of the world’s most iconic events. Every year, endurance athletes worldwide make the pilgrimage to Leadville, Colo., with the single goal of competing in “The Race Across the Sky.” Visit www.leadvilleraceseries.com for more information. As The Healthy Way of Life Company, Life Time Fitness (NYSE:LTM) helps organizations, communities and individuals achieve their total health objectives, athletic aspirations and fitness goals by engaging in their areas of interest — or discovering new passions — both inside and outside of Life Time’s distinctive and large sports, professional fitness, family recreation and spa destinations, most of which operate 24 hours a day, seven days a week. The Company’s Healthy Way of Life approach enables members to achieve this by providing the best programs, people and places of uncompromising quality and value. As of August 12, 2014, the Company operated 112 centers under the LIFE TIME FITNESS® and LIFE TIME ATHLETIC® brands in the United States and Canada. Additional information about Life Time centers, programs and services is available at lifetimefitness.com.